Questions which come in competitive exams from Logical Reasoning Cubes, are mostly related to number of cuts or painting of the cubes. To solve these questions the most important part is to visualize the cube. In this article we will try to understand the basic about problems related to Logical Reasoning Cubes. As you know cubes are three-dimensional figure with each of its dimension having same measurements. The dimensions are named as length, breadth and height. Let us first start with questions related to cutting the cubes into different number of pieces. If a person cuts a piece of cube along any of its dimension then he gets two pieces. Now if someone makes ‘N’ number of cuts along its length then there will ‘N + 1’ number of pieces coming out of the original cube. One can visualize something similar to the above picture and see that after making 6 cutes we have 7 pieces. To generalize we can say, to have a certain number of pieces (P) along a specific dimension there should one fewer (P – 1) number of cuts required. Now let us extend this to different number of cuts along different dimensions, if we have ‘L’ number of cuts along length, ‘B’ number of cuts along breadth and ‘H’ number of cuts along height then the number of pieces along these dimensions would be ‘L + 1’, ‘B + 1’ and ‘H + 1’ respectively. Hence, total number of pieces would be (L + 1) (B + 1) (H + 1). Let us start this with three cuts. Now we know for 3 cuts along a particular dimension there will be (3 +1) = 4 pieces. But if we make 2 cuts along one dimension and 1 cut along another dimension then the number of pieces according to the formula given above will be (2 + 1) (1 + 1) = 6.So we can see that number of pieces would increase if we distribute the number of cutes along different dimensions. Hence, to maximize the number of cuts here we should try to distribute the total number of cuts along each dimension as uniformly as possible. What’s the maximum number of pieces that can be obtained with 17 cuts without putting the pieces one above another? Here, we can split 17 as 5, 6 and 6 which is the most equally distributed case. So the number of pieces will be (5 + 1) (6 +1) (6 + 1) = 294. By making at least how many cuts can a cube be cut into 210 smaller pieces without putting the pieces one above another? Here, we can see 210 = 5 x 6 x 7 and this is the most uniformly distributed way to write 210 as a product of 3 numbers so we can say to have 5 pieces along a dimension there must be 4 cuts. 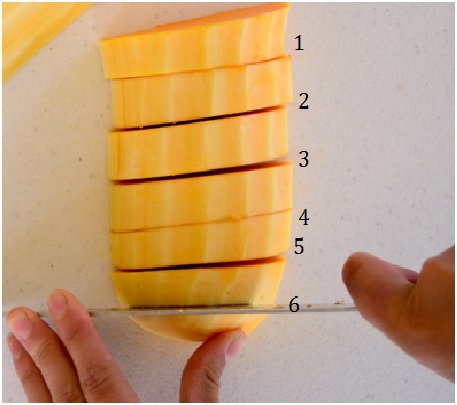 So total number of cuts = (5 – 1) + (6 – 1) + (7 – 1) = 15. Now we will move to the second part where we understand the concepts related to painted cubes. A bigger cube is painted yellow on each of its faces. Now the cube is cut into 216 identical pieces making minimum number of cuts. Question 1, how many of the smaller cubes will have exactly three faces painted? Question 2, how many of the smaller cubes will have exactly two faces painted? Question 3, how many of the smaller cubes will have exactly one face painted? Consider the following diagram where 3 faces are visible. We should be aware of few terms such as corners, faces and edges. Here we can see that a cube has 8 corners, 6 faces and 12 edges. 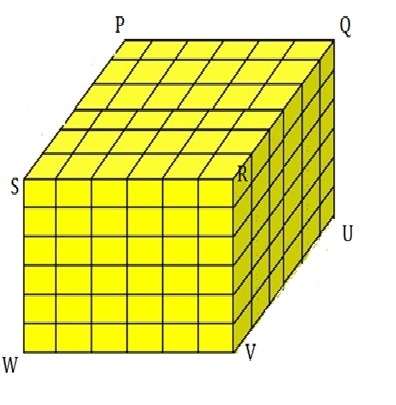 For the above figure the corner points are denoted as P, Q, R, S, T (which is not visible and is the farthest corner from R), U, V and W.
The twelve edges are PQ, QR, RS, SP, TU, UV, VW, WT, PT, QU, RV and SW. The six faces are PQRS, TUVW, PQUT, QUVR, RVWS and PSWT. Question 1 – The cubes at the corners will have three faces painted, so we have 8 of them. Here in the figure 1 we can see 7 of them. For a proper cube the answer is always 8. Question 2 – The cubes at the edges (excluding the corners) are the cubes with two faces painted. So we can see for an edge there are 4 cubes having two faces painted as given in the figure 2. So for 12 edges we will have 12 x 4 = 48 cubes. Question 3 – The cubes at the faces (apart from the edges) will have only one face painted. As shown in the figure 3 there will be 16 cubes for each face so there will be 6 x 16 = 96 such cubes. For an n x n x n cubes the answer will be 6 x (n – 2)2. For an n x n x n cubes the answer will be n3 – [ 6 (n-2)2 + 12 (n – 2) + 8] = (n – 2)3. Check Out CAREER ANNA LOGICAL REASONING COURSE HERE. TRY TO SOLVE THE OPEN QUIZ QUESTIONS ON CUBES AND COLORED FACES HERE.